Who is your client and what are its media goals? Philip Crimaldi: Warner Home Video (WHV) is the leading provider of home entertainment DVDs in the US. [It wants] to dominate the market, so it is looking for broad coverage, but in this case [it was] looking for a huge New York media hit for the [NFL Super Bowl XLII Champions: New York Giants DVD] release, which was [released] just 23 days after the game. What made the New York Post such a good hit? How did you pitch editors and reporters there? Crimaldi: We knew we could get sports coverage, but we wanted to reach a broader audience, and the Post's Sunday Pulse section is a terrific way to do that. We reached out to Isaac Guzman, the paper's DVD and film reporter. He normally covers traditional films, [but] he jumped at the chance of doing this story. Given the Giants had just staged one of the biggest upsets in pro- football history, did you need any other angles to interest the Post? Crimaldi: We didn't, but what helped was we were able to get [Guzman] an advanced copy within days of contacting him, which gave them plenty of time to put together a full feature. Did you have to arrange any interviews for this story? What other content did you provide to help clinch this placement? Crimaldi: We [had Guzman] talk to Eddie Scannell, [WHV's] director of sports marketing, who provided background on how the DVD was put together. We also provided information on a Times Square event, featuring several Giants, which formally launched the DVD. Crimaldi: The Post story kicked off a flurry of coverage, both in New York and nationally. 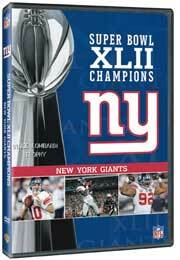 As a result, [Super Bowl Champions XLII] is already one of [WHV's] best-selling sports championship DVDs, even though it's only been out for less than two months.